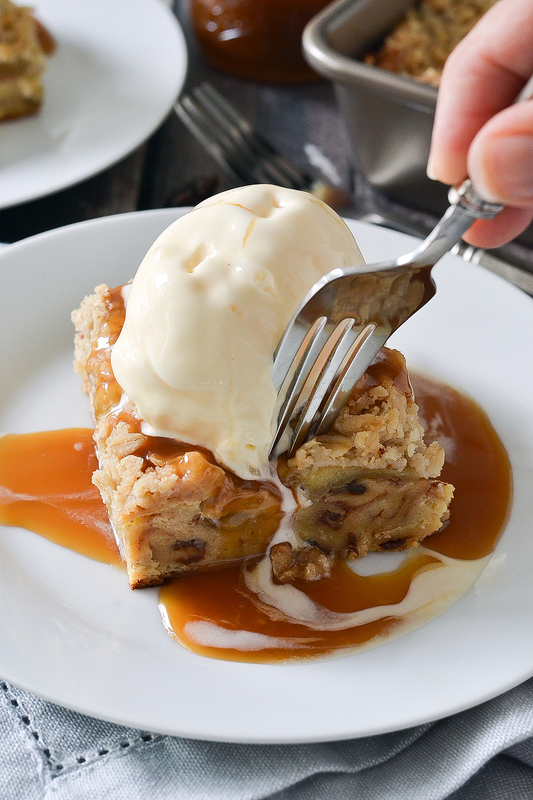 An easy recipe for Apple Cinnamon Bread Pudding that is perfect to serve for breakfast, brunch or dessert served with a creamy scoop of vanilla ice cream and drizzled with warm caramel syrup. Fall is in the air my friends! Here in Buffalo the leaves are finally starting to change. I live in a wooded area so I absolutely love watching the colors slowing change. In just a few weeks the trees will be bursting with vibrant colors that I just love to see and watch change year after year. It never gets old! My family and I have already checked off some of our favorite fall activities on our fall bucket list including getting lost in the corn maze, shooting corn from a canon, taking a hayride and my favorite, apple picking. After a day of fun fall activities we love to come home, have a fire and cuddle up with a good movie. And nothing beats fall food, right? Who doesn’t love cozying up with a warm bowl of soup on a crisp fall day or coming home to a hearty stew that has been simmering in the slow cooker all day? 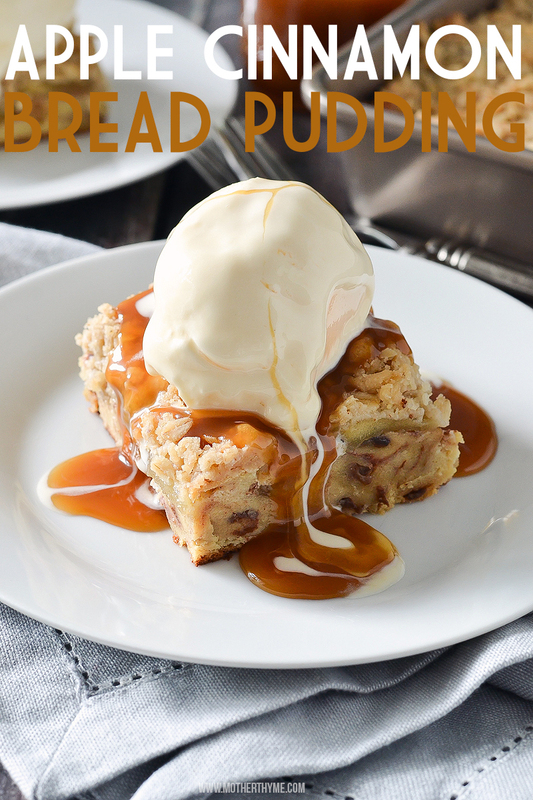 Fall comfort food is my favorite especially when it comes to desserts like this incredible Apple Cinnamon Bread Pudding topped with a scoop of vanilla ice cream and drizzled with warm caramel sauce! What’s not to love about that and who wouldn’t love a slice of this right now? 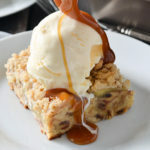 Not only is the Apple Cinnamon Bread Pudding great for dessert it makes a great breakfast or even brunch casserole too! Perfect for any fall or holiday potluck you have on your calendar! This delicious Apple Cinnamon Bread Pudding is made with Martin’s Cinnamon Raisin Swirl Potato Bread which my family absolutely loves! We love it for breakfast simply toasted with some butter. 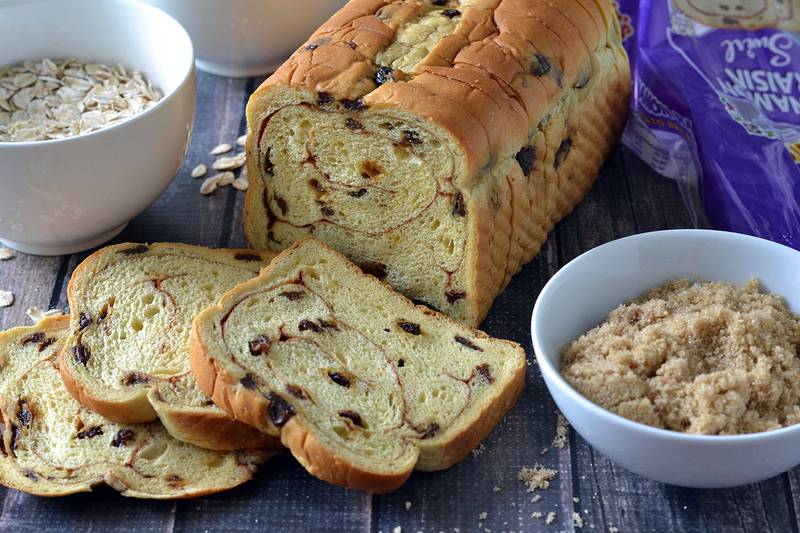 It’s got all the goodness you want in a slice of bread including cinnamon and raisins and it’s only 90 calories a slice! PLUS it doesn’t have all those weird things like high fructose corn syrup, artificial dyes, trans fats, GMO’s and cholestrerol. It’s pure yumminess in every bite! My daughter love this bread right out of the bag! I don’t blame her. It’s that good! It’s even good warmed up for a few seconds in the microwave and topped with a little apple butter. I’ve certainly enjoyed that a slice or two for a mid-afternoon snack! 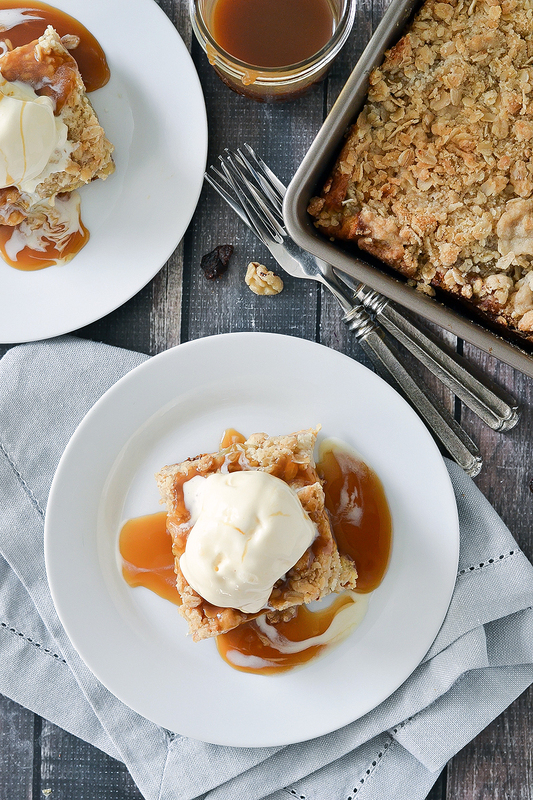 So what makes this Apple Cinnamon Bread Pudding so special? Well, where should I start? First, it’s made with good quality bread like Martin’s Cinnamon Raisin Swirl Potato Bread. It’s bread pudding so you want to of course use good since bread is the star of the show! I take a loaf of Martin’s Cinnamon Raisin Swirl Potato Bread and cut the slices into chunks and put into a 9×13 baking dish. Super easy! Next, I whip up a some eggs, whole milk, heavy cream, sugar, cinnamon and vanilla and pour that over the bread and let it absorb into the bread for a couple of minutes. While that’s absorbing I whip up a topping. 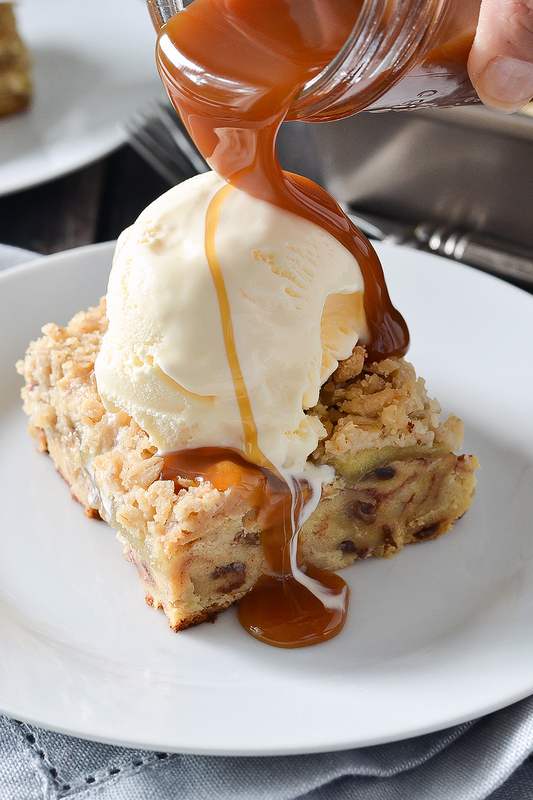 Yes you heard right a crumb topping which takes this scrumptious bread pudding to another level! The topping is just butter, oats, flour, brown sugar, cinnamon and a pinch of salt. Mix that all together until crumbly and set aside. I top the bread with a can of apple pie filling! You could totally use fresh sliced apples too that is mixed together with some sugar, cinnamon, allspice, a flour. You can check out the recipe below for that option. Add the apples on top of the bread mixture than sprinkle with the topping then it’s off to bake! Easy peasy my friends! So if you are looking for some yummy fall recipes to try this season you’ll want to add this to your baking list! Whether you serve for a breakfast, brunch or dessert, it will be the perfect addition to any fall gathering! 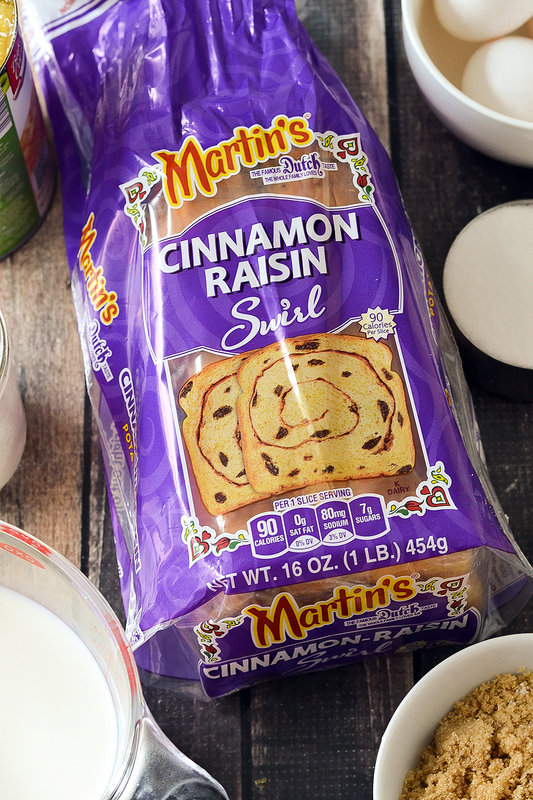 You can find Martin’s Cinnamon Raisin Swirl Potato Bread in the bread section at your local grocery store. 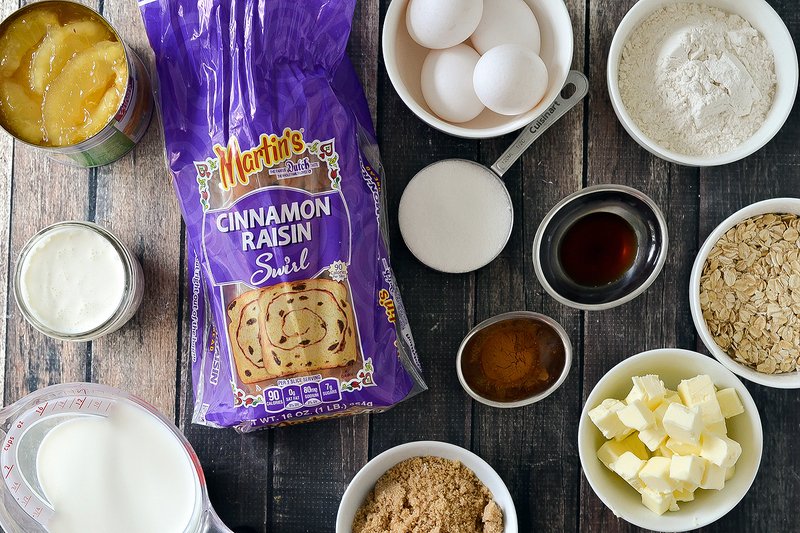 Be sure to stay connected with Martin’s Potato Rolls on Facebook, Twitter, Pinterest, and Instagram! And for a tasty treat don’t forget to try a slice warmed up topped with a little apple butter! It’s so good! Cut bread into roughly 1-inch square pieces and spread on the bottom of baking dish. In a large bowl mix together milk, heavy whipping cream, eggs, sugar, brown sugar, cinnamon, and vanilla extract until combined. Pour mixture over bread and gently mix together until all the bread pieces are covered with the liquid mixture. Let it sit for a few minutes to allow the liquid to absorb into the bread. Top bread with apple pie filling. In a medium bowl mix together butter, oats, flour, sugar, cinnamon and salt using a pastry knife of fork until mixture crumbly. Alternatively you can add mixture into a food processor and pulse a few times until combined and crumbly. Sprinkle mixture on top of apples. Bake on the center rack for 45 minutes or until the top is golden brown anda the center of pudding comes out clean. You can use fresh apples instead of canned apple pie filling. For fresh apples peel and slice 3 cups of apples (about 4 or 5 apples) and add to a large bowl. Toss with ½ tablespoon lemon juice, ¼ cup sugar, ¼ cup light brown sugar, 1 ½ tablespoons all-purpose flour, ½ teaspoon cinnamon, a pinch of ginger, nutmeg and all spice. 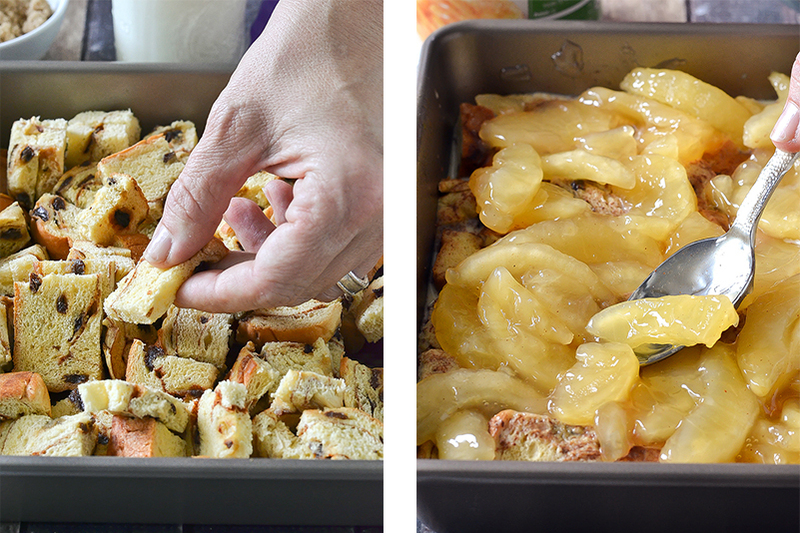 Spread this apple mixture on top of bread and proceed with remaining instructions. Disclosure: This post is sponsored by Martin’s Famous Pastry Shoppe/Martin’s Famous Potato Rolls. Thanks for supporting brands I love and work with. All opinions are 100% my own.